Whole fruit is good for you! If it's organic - there's no chance you'll be eating toxic chemicals! Nature packaged all fruits with plenty of healthy fibre and phytochemicals which have many proven health benefits for us - despite the fact that some people call them 'nature's poisons' - which is frankly total nonsense! Phytochemicals - or phytonutrients as they are otherwise called - evolved to protect plants naturally from pests and diseases or even sun damage and they do exactly the same for us. Well known examples of that are the antioxidant phytochemicals lycopenene and anthocyanin in tomato skins. On the other hand - the added 'free' sugars in many manufactured highly processed foods IS a huge problem for us. Products such as sweet pastries, biscuits, crisps etc are mostly high in added sugars and sugar is even added to 'ready meals', pasta sauces and curries for heaven's sake! The kind of cheap, industrially processed sugar that is normally used for these is High Fructose CornSyrup - or HFCS - which is made from genetically modified maize and is a form of very refined fructose which is instantly available to the body. Just like drinking a high percentage alcohol it has an immediate effect on the liver. Fruit juices can also be a problem - they raise blood sugar dramatically fast as they've had virtually all their natural fibre removed. I know some people say that we shouldn't be eating fructose and because fruit contains fructose we shouldn't be eating it - but whole, naturally grown fruit is an entirely different thing! I really think a little common sense and balance is needed in the fruit debate. We evolved to eat natural, whole fruits with everything they contain - humans have been eating them for millions of years without harm - unlike ready meals, refined flour, HFCS and other more recent sugar-filled nasties! For millions of years fruit has been the perfectly-packaged, seasonal, 'ready meal' of choice for man and many other creatures too. I doubt that our closest relatives chimpanzees get type 2 diabetes - except perhaps those poor creatures confined in zoos with little natural exercise and given over-ripe bananas! Nobody ever became ill from eating whole fruits and vegetables grown naturally without chemicals, because it's almost impossible to over-eat whole foods that contain a lot of natural fibre - although believe me I've tried! The fibre has such a dramatic effect that you actually can't! There is no healthier food on the planet than whole organic fruit so don't let anyone make you feel guilty about eating it in moderation as a healthy treat. Mind you - it can be expensive if you have to buy it - so what better reason could you possibly have to grow your own organic fruit? And remember - you'll get plenty of healthy exercise and enormous satisfaction from growing it too! What Fruit is Available to Pick Now? You might think that there's no fresh fruit that you could pick at this time of year - and that you will have to rely on what you've got stored in your freezer or apple store - but if you have a polytunnel you'd be wrong! This year I once again grew Cape Gooseberries (Physalis Peruviana) in my recycled mayo. buckets. I've grown often them in the ground but they tend to take over to put it mildly as they're extremely vigorous! They're much better mannered in the 10 litre buckets - although still about 4ft/1.3m. high and wide! They're earlier too - possibly due to the root-restriction. They started ripening in late August and I'm still picking them - despite the recent low temperatures. I'm still picking plenty off the plants every week. They will also keep for several months in the salad drawer of the fridge if picked carefully, complete with their decorative little paper 'capes' which cover and protect the fruit. That's why they're called 'Cape' - not because they come from there! And they're not related to gooseberries either! They're actually a South American native - like so many of the Solanaceae/nightshade family - and are in fact related to potatoes! That's where the resemblance ends! They are absolutely delicious raw. When just ripe they have a mouthwatering, sherbetty/mangoey/pineappley flavour - after being kept in the fridge for a few weeks they tend to develop a slightly sweeter 'apricotty' flavour as well. You often see them on dessert plates in restaurants - but many people don't try them because they don't know what they are. They're extremely easy to grow from seed started early in March - and will even grow outside happily in summer - but they do much better in a greenhouse or polytunnel where they will fruit for much longer - then you can have the fresh fruit for Christmas. Unlike tomatoes you don't even have to remove side-shoots because they grow as bushes. Ripening obviously slows up as the weather gets colder - but I'm still picking a few every day now with plenty stored in a bowl in the fridge. They're tender herbaceous perennials, so if you can keep plants over the winter - cutting them back to the base in spring if they haven't completely died back - they will fruit much earlier the next year. I did that with some planted in the tunnel beds years ago and will try to overwinter a few in pots this year - just keeping them barely 'ticking over' with the compost almost dry. They will fruit much earlier next year then. The bees love the flowers too. They freeze really well and dehydrate well too. When dried and concentrated, their flavour is sharply mouth-watering and delicious scattered over winter salads. 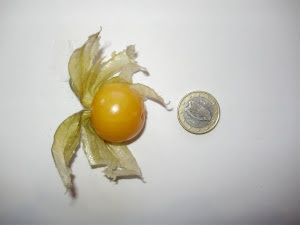 Cape gooseberries are very high in the phytonutrient Beta-Cryptoxanthin - which is a pro vit. A carotenoid and a very potent anti-cancer and anti-aging antioxidant, which also effective against arthritis, age-related macular degeneration or ARMD (protecting eyesight), hepatitis, asthma and rheumatism. It has no known side-effects in medicine. Although I do know of a slight one - if you're greedy and eat more than a dozen or so fruit a day - they are far more effective at motivating the gut even than syrup of figs!! - Be warned as they're quite addictive! They're also used in Chinese medicine for treating abscesses, coughs, fevers and sore throats. They are absolutely divine on a Pavlova - particularly with a couple of passion fruit squeezed over them - makes your mouth water just to think of it! And as they are very high in pectin - they also make jam easily - but I think that's a crying shame unless you've got acres of them. They're so much nicer fresh, and at this time of year fresh fruit is so welcome. Supermarket prices for any fresh 'exotic' fruit are horrendous at this time of year - and these are actually far easier to grow than tomatoes! They are also delicious dipped in melted dark chocolate - but then - aren't most things!? Urgent work that needs doing now! Prune grapevines, indoors and outside NOW or as soon as possible. This is urgent as doing them now gives them a chance to heal their wounds properly. Yesterday I actually thought I saw some grape buds that were slightly swelling - or maybe that was my imagination! Whatever - if we have a mild spell after Christmas or in early January they can start into growth early - and with the sap rising fast could bleed to death, or be severely weakened. Grapes in containers are the first priority - they always seem to start growing just that little bit earlier than those planted in the ground. Although the upside of that is that you could give them their winter rest against a north facing wall - one of the many tricks that kitchen gardeners of centuries ago used to either bring forward, or hold back plants. I've never found most grapes to be really successful outside here in this part of Ireland - we're much too cold and wet. In parts of the UK where it's drier, there could be some newer varieties of seedless grapes now that might be worth trying - but whether they are seedless or seeded varieties - you need to get an early fruiting variety and grow them on a warm, south-facing wall. I've seen Muscat of Alexandria for sale everywhere here in Ireland - and it's not at all suitable for outside here because it ripens far too late, even if you have an extremely warm spot outside for it. The same goes for Flame - a red seedless grape. They will ripen properly, but still pretty late, in a polytunnel or greenhouse. Outside grapes are always smaller-fruited too unless you thin them. The main problem outside would be any damp weather at the flowering stage hindering pollination - and also when fruiting as damp weather can cause rotting of bunches. Also of course there's the perennial problem of birds and wasps! I grow quite a few varieties in large pots and move them out of the tunnel in the winter as they're actually very hardy - but at flowering time up until fruiting time I bring them back inside - unless I want to delay ripening a particular variety, as I've mentioned before. One variety of grape that I planted outside years ago - more for just decorative effect - is a small fruited one called 'Brandt'. It is one of the most reliable outdoor grapes available anywhere in the British Isles and does produce bunches of very small, deep red-brown, very sweet grapes prolifically in two out of three years here, trained over a garden arch - not even a south facing wall. If you just want one for throwing complete with pips into a smoothie - that would be one well worth trying. I took cuttings of it a couple of years ago as I'd read somewhere that it's high in phytochemicals like heart-healthy Resveratrol. I'd never actually tried it inside until last year - and even a young potted vine did well. It has the most stunning autumn colour too - so is worth growing just for it's decorative qualities! I think it may need some serious taming inside though - so it's well-suited to more restricted pot growing! It's fairly widely available online. I have a late couple of bunches of 'Flame' seedless grape which I'm hoping will keep until Christmas and as it's so close now, I think they might manage to make it! Next year with a couple of the later varieties I want to try the old fashioned method of cutting a bunch complete with a bit of stem - and putting the stem in a bottle of water in a darkened room in order to keep the grapes until Christmas -as the incredibly skilled and knowledgeable gardeners in the old walled gardens of great houses used to do. 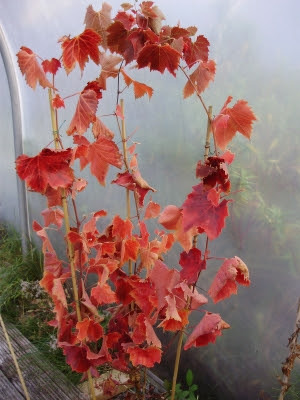 As I mentioned last month - you can also take cuttings of grapes now - they're very easy. When you're pruning you should have plenty of propagating material. Take a length of stem - preferably ripened and brown - with three buds, cutting just below the bottom one. Then rub off the top and bottom buds - leaving the one in the middle. Pot the cutting up in a gritty, free draining compost with the remaining bud just at soil level - and put it somewhere shady and sheltered - where it won't get frozen - making sure it doesn't dry out - until spring - when it should start to sprout roots and grow. You should have a 90% success rate with this - as long as the cutting doesn't dry out. Layering is another way I've tried with 100% success - but as this takes almost a year - it obviously takes longer to produce a separate plant but is the most reliable method. You literally just bend a long stem down to the ground, cover it with soil and put a large cobble or large heavy stone about the size of a brick on top of that. Just keep it moist over the summer - don't let it dry out and it's virtually guaranteed to root. You can then just cut it off from the parent shoot and pot the rooted bit up. Another thing the old gardeners used to do, which I keep meaning to try, is training a stem of a late ripening variety of grape up through a hole in the bottom of a pot. They then used to cut off the rooted stem below the pot it had rooted into - complete with attached bunches of grapes - and use the potted plant as a centrepiece for a table flower arrangement at dinner. That would be a rather fun way of propagating another plant to bring inside in the autumn - although I think one might need a pretty large table! Blackcurrants. Cut out most of the old fruited dark wood, leaving nicely spaced young (lighter wood) growth from this year. I usually do this in summer, combining my pruning with picking by cutting off fruiting branches, bringing them inside and picking off the fruit in comfort on the kitchen table. That takes care of two jobs at the same time and saves the backache! I would definitely recommend this method. Years ago we were told not to cut all of the branches off - just a third - but friends of mine in Herefordshire, who grow blackcurrants for a well-known cordial, use mechanical harvesting now to save labour costs and cut off all the branches off every year - with no ill effects - the bushes do need to be well fed though - and as this is done in the summer at harvesting time - the bushes have time to make new growth that year on which to fruit in the following year. Blackcurrants in particular love plenty of nitrogen - so if you have hens, putting them in the fruit cage under the blackcurrants in winter is a good idea - not for too long though or they will sour the ground. The hens will also pick up any gooseberry sawfly eggs which may be around - these can decimate your bushes in the spring and summer by stripping off all the leaves and just leaving the skeletons! It's often on any new bushes you might buy - but the hen trick works a treat! Nature's natural pest controllers! Red and White currants, Gooseberries. Shorten new (paler wood) leader growths to 15cm/6" and fruiting laterals to about 5cm/2" - Both red and white currants fruit on small fruiting spurs (side shoots) growing off a permanent framework of branches - so in the early days you need to prune to build up that framework - only pruning whole branches out when the bush gets older if it becomes too congested. Recently on TV I saw a so-called 'expert' telling people to cut redcurrants down to the ground each year - I think they'd be a bit disappointed with their crops!! Cuttings of all these should still work if you want to try some of the prunings - just stick them in the ground somewhere out of the way! Layering also works well for them too - but stick a large brick or stone onto the bit of stem you want to root or otherwise they may spring up again out of the soil when half rooted next year! 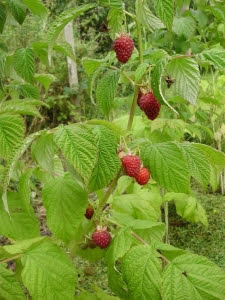 Raspberries - summer fruiting varieties only - you should have cut back all the old (brown and woody) canes which fruited in the summer straight after fruiting to allow the new (green and sappy) ones room to develop. Autumn-fruiting varieties need different pruning though - all the old canes which fruited this autumn would actually carry another crop next June - slightly lower down the stems - even the older varieties like 'Heritage' and 'Autumn Bliss' will do this - although theirs would be much smaller and hardly worth having. Those two varieties are also extremely rampant and can become seriously troublesome weeds! They also don't have too much flavour. The newer 'primocane' varieties like 'Joan J' and 'Brice' however, will have delicious fruit in early summer which are just as big as their autumn crop - so leaving at least some of their canes to fruit again is really well worth it. Contrary to conventional advice (just like so many things I do!) - I cut down only about half of the fruited canes each winter, leaving some of those which fruited in the autumn, as they'll carry another crop early the next summer. After that they'll be cut right down too, making new growth then which will also fruit in autumn, but slightly later. Doing this staggers the crop really well, but don't leave all of the old canes un-pruned, as you may exhaust the plants and restrict air circulation to young growth coming up. If you're tight for space - I wouldn't bother growing only the summer fruiting varieties at all. The newer primocane autumn-fruiting varieties will give you a crop lower down on the previous year's canes in June and then again from August onwards on the new canes formed in the spring until the first frosts - so you get double the crop from those canes - and they also seem less prone to problems. These newer varieties are far more worth the space they permanently occupy. I haven't seen either 'Joan J' or 'Brice' available here anywhere - so you will have to get them mail order if you want those varieties. 'Joan J' has been a huge success grown in large pots in the west tunnel this year too - I only picked the last at the end of last week.Unfortunately although there are some green ones still developing on the canes - this damp weather has made them more vulnerable to botrytis (grey mould) so they probably won't ripen fully. I'll split the plants in half and re-pot them all after Christmas. That will be a lovely job for a cold damp day with the prospect of even more delicious fruit next year! Blackberries and Loganberries/Tayberries - cut out all of the old fruited canes/branches from last summer. Tie in young growths which will fruit next year, to stop them getting damaged by whipping around in our strong winter winds! Don't prune any outside stone fruits like plums peaches and cherries - at this time of year! Doing this could cause silver leaf disease. You should prune them in the spring when the sap is rising. If you have peaches or nectarines standing outside in pots bring them into the tunnel now if you have room - this avoids peach leaf curl, which is caused by rain washing the disease spores down into the buds as they emerge in spring. This is never a problem on peaches grown permanently in the ground in tunnels. Apples and pears. Prune out dead, diseased, crossing and overcrowded branches first. On a young tree - aiming for an open cup shape so you get good air circulation is extremely important in our often damp climate here. Get a good book on fruit pruning if you're interested in training trees into espaliers etc, or even better send for a really good fruit catalogue, they usually have pruning guides in them, and are free! It would take far too long to explain the various intricacies here! Alan Titchmarsh's pruning book is excellent if you want to buy one. Order fruit trees for planting when soil conditions are suitable. Mail order is the only way to get many heritage varieties. There's not much choice in most of the garden centres, they tend to sell Golden Delicious and Granny Smith (only suitable for continental climates!) or Cox's Orange Pippin (only suitable for the dry climate of Kent! Queen Cox or Holstein Cox is better) The garden centres tell me that's because most people only know those names and so they ask for them as they're the ones they see in supermarkets, but they're really not suitable for growing in Ireland, unless you're in a particularly warm dry spot that I haven't yet discovered! Why don't garden centres tell people that - they don't seem to care if people are disappointed as long as they buy them then! Rather short-sighted as the customer won't come back! Wherever you get them - make sure they've got a really good list - which has plenty of information on root stocks and the flowering, fruiting and ripening/eating times of particular varieties. It's amazing how little information some websites give! There are some good nurseries, but always ask what varieties they have - and on which root stocks. Don't tell them what you want first - before they tell you what they have! Some are like horse dealers - they'll tell you whatever you want to hear!! 35 years ago, when I knew an awful lot less, I was sold a few 'pups'! You learn by experience! But sadly with fruit trees it can take a few years to see what you've got - by which time you've probably got an ailing unproductive tree, have lost 5-6 years and it's often too late! As I grew up on the edge of the Vale of Evesham,(one of the main fruit growing areas of the UK) and we had a 6 acre orchard of lovely old trees, when I planted my orchard here, I wanted to have a good range of varieties. So I planted both historic and new cookers and eaters, to ensure that I could have a good variety of apples all year round, straight from the tree, as well as some that would store through the winter. I planted over 50 trees, and I've planted many more since. I've grown many varieties on various root stocks and believe that the only really suitable root stock for most Irish soils is the M26 or failing that MM106, these give a healthy, not too vigorous tree roughly 15 feet high (can be kept smaller) which fruits well. I've tried M9's which I find weak and very prone to disease in our wet climate on my heavy Meath clay and a few years ago as a trial, I planted some on the newish 'Coronet' dwarfing rootstock in the raised beds. Sadly I think this will probably be similar and only really suitable for well-drained, perfect conditions in tubs and pots as well. I don't think so far that they will ever give a worthwhile crop if you're trying to self-sufficient in your own fruit like us, rather than just having a decorative bit of fun! It will also be a few years before I can truly judge just how disease resistant they are - an important consideration in our often damp climate - particularly growing organically. I would never use any pesticide or fungicide sprays. They don't look too promising though. They're expensive too - about four times the price of any variety on M26 - which will go on producing increasingly abundant and healthy crops for many years! One variety really worth trying, if you like 'Cox's Orange Pippin' - is 'Holstein' (or 'Queen Cox'). It tastes exactly the same as Cox's, is crisp, delicious and four or five times the size! Picked at the end of Oct., it keeps crisp until Christmas. (stored in an old freezer in carrier bags - far better but naturally not as decorative as those lovely wooden apple shelves with trays) Holstein is also very disease resistant, but needs two other pollinator apples nearby, as it's a triploid variety - meaning that it has no good pollen of it's own. It's also better grown as a bush tree, rather than trained, as triploid varieties are more vigorous (another beginner mistake I made! It keeps trying valiantly to escape and having left it un-pruned for a couple of years because of my broken shoulder - I no have a major job of pruning to do!! Bramley and Ashmead's Kernal are also triploid varieties and behave the same way. In suburban back gardens there are usually apples of some sort growing nearby which can serve as pollinators. Otherwise James Grieve (early mid-season cooker/eater) and Grenadier (early cooker) are both excellent pollinators for it. Or look for something else which flowers at the same time - any good catalogue will tell you the exact pollination groups of trees. I don't like those 'family trees', they're a nice idea and a novelty but they don't give worthwhile crops, and can be very complicated to prune, even for the experienced fruit grower, who can usually recognise which branch is which! And if you don't prune, they will quickly degenerate into a disease-ridden, unproductive muddle! They can't just be left to their own devices - so if you want just one tree - then find a good self-pollinating variety with fruit that keeps for a little while. Lemons beside young plants of climbing French beans and calabrese in springIf you're looking for something extremely decorative, incredibly perfumed, delicious and great for impressing your gardening friends, there's nothing better! Imagine home grown lemon sorbet at Christmas - or a home grown slice of lemon in your guests' G&T! I've always been fascinated by them, and because it was impossible to get organic lemons anywhere 30 years ago, I've been growing them ever since - even though organically grown lemons are available most of the year now. They're much the best of the citrus family for beginners, and do produce a worthwhile crop most years. (They're actually worth growing just for the wonderfully scented flowers alone!) They just need a little understanding and TLC, then they're not difficult if you can bring them inside in the winter, away from hard frost. They're fine outside all summer, sheltered from the wind. They are actually acid loving plants, which means you treat them like Rhododendrons and water with rainwater. ONLY water them when they dry out - nothing will kill them quicker than their roots sitting in water! You can get a citrus feed (chemical) or I top dress in spring with 'Osmo' organic all purpose granules and feed with Osmo liquid feed, or nettle liquid feed later, as they like a high nitrogen feed, but they hate potash, so don't use tomato feed as I saw one article recommending. Mind you - that 'expert' even got his phosphates and potash mixed up!! The main pest of all citrus trees is scale insect, which seems to just appear from nowhere sometimes, but it's easily dealt with using an organic insecticidal fatty acid soap spray. Don't use it when the young very tender shoots are developing in spring - or you'll burn them. And never spray in strong sunshine - it has the same effect. I've had some success with Navel oranges, but not much with grapefruit, which really need more warmth. The easiest lemon varieties are Four Seasons, Ponderosa and Meyer's (an easy to grow, delicious, sherbetty-tasting, old hybrid). Aldi have really good lemon trees in the spring every year, around 20 euros, about half the price of most garden centres. 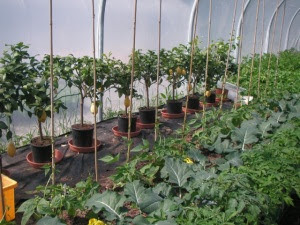 They're quite hardy, but a very hard frost will kill some of the small overwintering fruit and some of the young growth even if they are in the tunnel, although a cover of fleece will usually prevent this. It won't kill the trees though if you keep the compost pretty dry in the very coldest weather - and only start to water again when you see a little new growth starting in spring - often from the trunk. Limequats - a cross between a lime and a kumquat are hardy, easy and delicious too. I was in Johnstown Garden Centre near Naas in Co. Kildare the other day - and they have a good variety of really nice citrus plants for sale - they would make a super luxury Christmas present for a keen gardener. I've never been able to resist trying to sow anything from seed, particularly if it's free! A fun thing to try with any pips from your Christmas clementines and satsumas is to sow them individually in small yogurt pots, in a free draining seed compost. Choose the very fattest pips. They must be sown in separate pots because there is a fairly good chance that a few of the fattest pips may produce more than one seedling! These 'twins' or 'triplets' are then known as 'poly-embryonic' seedlings, meaning that only one will be a true seedling - and any additional plantlets resulting from the pip will be exactly the same as if you had taken a cutting from the parent plant! When these are an inch or so high, in spring, separate them very gently (they carefully pull apart quite easily if in a sandy, well drained compost like the Klassman organic seed compost) and grow them on in an acid well drained compost. These 'poly-embryonic' seedlings will eventually grow on and fruit, perhaps in as little as three or four years. You won't know which are the 'true' (like a cutting) or 'mongrel' seedlings until that happens, but the mongrels are often the most vigorous. It's easy, fascinating and fun if you have the time and patience! In the meantime, they make handsome small evergreen trees for a greenhouse or conservatory. I've had great success with them over the years. I also grew dozens of Kiwi fruit from seed over 25 years ago - very easy, and some of them have now taken over my 'jungle' area in the garden, with their beautiful huge jungly-looking red and green plush leaves just like velvet. Most exotic looking! They are extremely vigorous though - so need a lot of space! Avocados are worth trying too - they make great indoor foliage plants. Try some of these and you might have some home grown Christmas presents to give away next year - so much nicer than bought ones! A really terrific Christmas present for any keen fruit grower is a dehydrator. I bless the day when I bought mine - I absolutely love it and I use it for so many things!! You can see some of the delicious results above in the Cape Gooseberry picture - and here are some semi-dehydrated frozen peach pieces which I took a photo of earlier this week. They have the most intensely delicious, peachy flavour that you could possibly imagine, just like chewy peach sweeties. I prefer them only semi-dehydrated to just a pleasantly chewy leather-hardness, when they retain far more of their flavour and also nutrients. Again they are absolutely delicious on salads - but also utterly irresistible whenever I go to the freezer for something - so they don't tend to last too long!! I semi-dry Lakemont Seedless grapes in it too - to make the most heavenly sultanas. I don't like anything dried until it's crisp unless I'm actually making veg crisps - another naughty but very delicious use for the dehydrator! Dehydrating is a great way to use any damaged fruit which might go off before you could use them - so they prevent food waste too. Actually - a good dehydrator is a blessing and it's something that people rarely buy for themselves. That is - unless they're a very greedy fruit geek like me!! I Hope You Have a Very Happy Fruity Christmas Everyone & A Healthy Fruit-full New Year! Thank you so much to all the people who have taken the time to write and thank me for my work - or thanked me on Twitter. I really enjoy sharing my original ideas and 40 years experience of growing and cooking my own organic food with you. It's most satisfying and naturally also very complimentary if others find "inspiration" in my work. - But if you do happen to copy it, or repeat it in any way online - I would appreciate it very much if you would please mention that it originally came from me. Thank you.